James was ten weeks old and had spent the night crying. Not just the normal ‘feed me / change me’ cry but a constant whimper. It was now 11am and he was asleep in his chair, he must have been tired as he hadn’t slept all night. I gave him his normal feed at midday but as soon as he’d finished – it reappeared! I took his temperature – 37.6 – that’s when I rang my Mum. 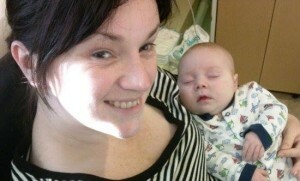 She advised that a dose of Calpol should do the trick and just let him go back to sleep to try and fight off the bug. James woke at 2pm and I began to change his nappy. It was then I saw an image that will haunt me for the rest of my days. James had the scary red pin prick rash across his back. I ran into the kitchen to get a glass, praying that it would disappear as soon as I rolled it across his torso, it didn’t. The symptoms of meningitis raced through my head. I wouldn’t say that I am the most athletic of people, but I have never moved faster to get my son into the car, also managing to manically phone his Dad to tell him at the same time. We arrived at A&E in Wrexham, fully expecting the nurse to tell us that I was panicking and not to worry – that I was being an over-protective new Mum. How wrong could I have been! We were on the High Dependency Unit on the Children’s Ward before I knew it . By 5pm James had had a range of blood tests, urine tests, a lumbar puncture and had started a course of strong antibiotics. 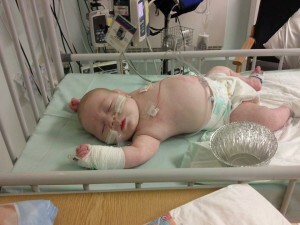 After three days, James was still not responding to the antibiotics and Alder Hey were monitoring his progress. We spent sixteen days on the ward not knowing what type of illness James had; it was thought an unknown a virus was doing its worst. James was eventually diagnosed with Kawasaki Disease and treatment began. We had never heard of Kawasaki Disease – we just associated the name with motorbikes. Kawasaki disease (or syndrome) is rare acute childhood illness that hits out of the blue, mainly affecting children under the age of five. The cause of Kawasaki’s is unknown; however it is thought that a virus triggers a rare immune reaction in certain children. It is an inflammatory process that can affect almost every system in the body, although the arteries that supply blood to the heart (the coronary arteries) appear specifically affected and this was the case with James. After a course of immunoglobulin and 4 weeks in hospital, follow up tests revealed that he had developed a rare complication – two large coronary aneurysms. Both aneurysms were 5mm at diagnosis; they now appear to be regressing and are currently around 3mm. 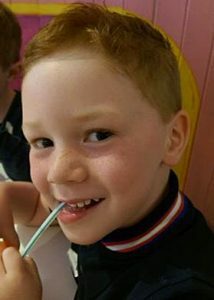 James now takes 75mg of aspirin daily and is monitored closely by the cardiac team at Alder Hey. The hope is that as James grows, the aneurysms will shrink and the arteries will return to a normal size. There is the risk of scar tissue forming which can be corrected by a stent – however all the signs so far are positive and the aneurysms seem to be slowly reducing in size. We keep an eye on him to check for any nasty bruises because of his medication, he can get tired easily and I panic every time he gets a cold! But does that bother James? No way! 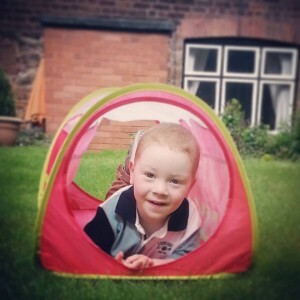 He’s now a happy six year old, who loves to run everywhere and lives life to the full!